Google Maps has a nifty new mapplet that allows US voters to check where their polling place is located. Currently voting locations are available for DC, DE, NH, NM, OH, SC, and VT and voter registration information is available for all states. 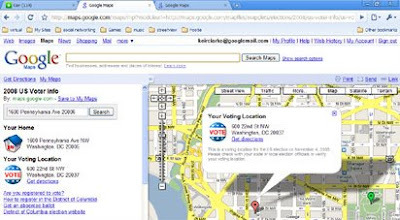 To use the mapplet voters simply enter their home address and Google Maps will tag the voting location and show its address. Voters can even use the 'Get directions' option to get driving or walking directions to their polling place.